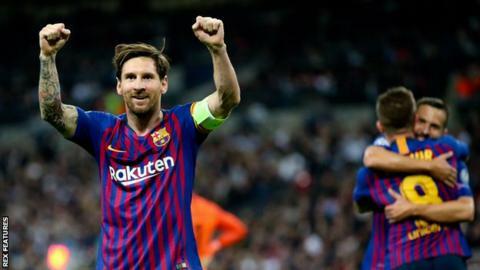 Lionel Messi produced a Wembley masterpiece to condemn Tottenham to their second successive Champions League defeat as they were beaten by Barcelona at Wembley. Messi was the magnificent orchestrator behind a superb attacking display from the Catalans that eventually proved too much for spirited Spurs, who also lost their opening Group B game to Inter Milan in Italy. Spurs keeper Hugo Lloris, back from injury, gifted Philippe Coutinho Barcelona's opener inside two minutes with a reckless dash from goal before Ivan Rakitic put them further in control before half-time with a spectacular 20-yard strike. Messi hit the post twice before Harry Kane gave Spurs hope with a clever low finish before the Argentine superstar slid home from close range to restore Barcelona's advantage. Erik Lamela's deflected effort set up a grandstand finish but it was fitting that the peerless Messi had the final word with a simple strike after Luis Suarez's brilliant dummy. The defeat leaves Mauricio Pochettino's side third in the group, six points behind leaders Barcelona and second-placed Inter Milan and facing a difficult task to progress to the knockout stages. In the pain of defeat, Tottenham's fans reserved plenty of acclaim for the magical Messi after another Wembley masterclass. The debate about the greatest player of all time is always guaranteed to spark passionate discussion, but on nights like this it is simply a pleasure to witness the work of a genius without having to make a decisive judgement. Messi may be 31 now but his brilliance is enduring and undimmed, summed up by one blistering spell in the opening phase of the second half as Barcelona attempted to press home their 2-0 interval advantage. The Argentine twice glided over a wretched Wembley surface, demonstrating that uncanny ability to move quicker with the ball at his feet than without it, but with the Spurs defence in panic-stricken retreat he struck the base of the post with sidefoot finishes on both occasions. Spurs had no escape, however. Twice they thought they had fought their way back, twice Messi snuffed out their hopes. He was the beneficiary of delicious dummies from Coutinho and Suarez to restore their two-goal advantage after Kane had pulled a goal back for Spurs, and was on the end of another brilliant feint from the Uruguayan to wrap things up after Lamela had again given the home side hope. Messi is quite simply a phenomenon. He has a tremendous work ethic, an ability to influence from all areas of the pitch and makes the decisive contributions when they matter. He thinks more quickly and more imaginatively than any other player in the world. And, as one final flourish in the closing seconds, he produced a blind backheel to Suarez that most footballers on the planet would not even think about, let alone pull off. Messi was magnificent at Wembley when Barcelona destroyed Manchester United in the 2011 Champions League final, an occasion which saw him score his first goal in England in the Catalans' 3-1 win. This was a display in the same bracket. It was a feat of endurance by Spurs to remain in this game until the closing minutes despite suffering some harrowing treatment at the hands of Barcelona's superstars, led by Messi. The first 45 minutes threatened to turn very ugly as Coutinho and Rakitic put Barcelona in control but Pochettino's side deserve full marks for guts and determination despite the obvious gulf in class. Many sides would have gone under in the face of the Barcelona barrage but Spurs stuck to their task to such an extent that they still carried hopes of an equaliser in the final stages of a thrilling game. In the final reckoning Barcelona were simply too good - but Spurs were also architects of their own downfall, producing crass errors such as Lloris's mad dash from goal that gifted Coutinho the opener inside two minutes. Spurs missed the guile of Dele Alli and the defensive strength of Jan Vertonghen, and it is on nights like this, against opponents such as this, that their squad looks stretched to its limit. A Champions League campaign that started full of hope for Spurs is suddenly a struggle after two opening defeats in what was unquestionably a tough draw. The loss to Inter Milan in Italy was cruel and undeserved and better sides than Spurs would have suffered at Messi's feet in this mood. Pochettino's side burnished their reputation in this tournament last season when they outclassed eventual champions Real Madrid at Wembley last November - now they must not return empty handed from the Netherlands when they face PSV Eindhoven on 24 October. Tottenham manager Mauricio Pochettino, speaking to BT Sport: "It was a tough game. When you concede in less than two minutes, it changes completely everything, the emotion becomes tough when you are playing against Barcelona and players like Messi and Suarez. "That is why I want to congratulate the team, because we were always in the game, always fighting, never giving up - I feel so proud. I'm disappointed with the result but the effort was massive. "But to give that advantage to a team like Barcelona is so difficult to come back from. "The most important thing was our character." Barcelona have won nine of their past 11 Champions League matches against English clubs (D1 L1), with this their first win in England since February 2016, when they beat Arsenal 2-0. Messi has scored more goals (22) and provided more assists (six) against English clubs in the Champions League than against sides from any other nation. Coutinho was involved in as many goals in his opening 28 minutes against Spurs for Barcelona (one goal, one assist) as he was in his 715 minutes for Liverpool against them (two goals). Coutinho's goal after 92 seconds was Barcelona's earliest Champions League goal since Mark van Bommel in November 2005 v Panathinaikos (36 seconds). Barcelona's Gerard Pique made his 100th Champions League appearance in this match, becoming the 10th Spaniard to reach this landmark. Tottenham midfielder Erik Lamela's strike was the 8,000th scored in Champions League history. Match ends, Tottenham Hotspur 2, Barcelona 4. Second Half ends, Tottenham Hotspur 2, Barcelona 4. Eric Dier (Tottenham Hotspur) is shown the yellow card for a bad foul. Luis Suárez (Barcelona) wins a free kick in the attacking half. Foul by Eric Dier (Tottenham Hotspur). Thomas Vermaelen (Barcelona) wins a free kick in the defensive half. Foul by Clément Lenglet (Barcelona). Harry Kane (Tottenham Hotspur) wins a free kick in the attacking half. Substitution, Barcelona. Thomas Vermaelen replaces Sergio Busquets. Goal! Tottenham Hotspur 2, Barcelona 4. Lionel Messi (Barcelona) left footed shot from the centre of the box to the bottom right corner. Assisted by Jordi Alba. Foul by Arturo Vidal (Barcelona). Lucas Moura (Tottenham Hotspur) wins a free kick in the defensive half. Substitution, Barcelona. Arturo Vidal replaces Arthur. Lionel Messi (Barcelona) wins a free kick in the defensive half. Foul by Toby Alderweireld (Tottenham Hotspur). Attempt saved. Davinson Sánchez (Tottenham Hotspur) header from the centre of the box is saved in the centre of the goal. Assisted by Kieran Trippier with a cross. Corner, Tottenham Hotspur. Conceded by Clément Lenglet. Attempt blocked. Harry Kane (Tottenham Hotspur) header from very close range is blocked. Assisted by Kieran Trippier with a cross. Attempt missed. Lucas Moura (Tottenham Hotspur) right footed shot from the left side of the box misses to the right. Assisted by Ben Davies. Substitution, Barcelona. Rafinha replaces Coutinho. Attempt saved. Lucas Moura (Tottenham Hotspur) right footed shot from outside the box is saved in the centre of the goal. Assisted by Harry Winks. Substitution, Tottenham Hotspur. Fernando Llorente replaces Erik Lamela. Delay in match Erik Lamela (Tottenham Hotspur) because of an injury. Offside, Tottenham Hotspur. Harry Winks tries a through ball, but Harry Kane is caught offside. Luis Suárez (Barcelona) wins a free kick on the right wing. Delay in match Gerard Piqué (Barcelona) because of an injury. Harry Kane (Tottenham Hotspur) is shown the yellow card for a bad foul. Gerard Piqué (Barcelona) wins a free kick in the defensive half. Foul by Harry Kane (Tottenham Hotspur). Offside, Tottenham Hotspur. Harry Kane tries a through ball, but Ben Davies is caught offside. Sergio Busquets (Barcelona) is shown the yellow card for a bad foul. Foul by Sergio Busquets (Barcelona). Erik Lamela (Tottenham Hotspur) wins a free kick in the attacking half. Attempt missed. Moussa Sissoko (Tottenham Hotspur) right footed shot from the right side of the box is too high. Substitution, Tottenham Hotspur. Moussa Sissoko replaces Son Heung-Min.